It’s official! Deputy Paws and the Puppy Mill Cause by Peggy Race has been named a Reading with Your Kids certified Great Read! At Reading with Your Kids, we only recommend the best books to read with your kids based on many hours of reading and research so that you can be sure that each one in our list of RWYK Certified Great Read is fantastic and will be worth your time. In this fully illustrated children’s book, Deputy Paws and the Puppy Mill Cause, we get an idea of what life is like for many dogs who are born in a puppy mill. Peggy’s book encourages parents and children to adopt a rescue dog rather than buy a puppy mill or pet shop dog. We highly recommend it to parents, teachers, and librarians. We enjoyed reading Deputy Paws and the Puppy Mill Cause and we hope you will too. Read on to learn all about Deputy Paws and the Puppy Mill Cause! Follow one young pup’s heartfelt call to action empowered by the dark shadows of his past…a must-read for animal lovers of all ages. Capture the enthusiastic spirit of Deputy Paws as he ventures out beyond the confines of his past. Rescued from a puppy mill, Deputy goes on a mission to save other dogs from the same sadness he endured. and where it does lead. on what dogs really need. In this fun rhyming adventure, an animated and whimsical cocker spaniel pup takes center stage as he defends the freedom of all dogs. From beginning to end, the seeds of kindness are planted within the beautiful illustrations that paint a vivid picture. be part of a trend. to this cause I defend. Deputy Paws not only gives us tools for change, one look into Deputy’s soulful eyes will inspire readers to find their voice and be part of the change. Be a defender! Grab your copy of Deputy paws and the Puppy Mill Cause on Amazon to be a defender! 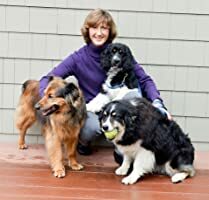 Peggy Race, is a Wisconsin-based children’s book author, literary memoir writer, an avid dog lover with a vision to create a better world for our canine companions. Where can you find Peggy Race on the internet? What more could you ask for than an entertaining AND educational picture book about a really important cause? Puppy mills are some of the worst operations in existence. Despite many wonderful organizations working to find and destroy them, they still succeed in many places. Deputy Paws and the Puppy Mill Cause is a brilliantly written rhyming picture book by Peggy Race and illustrated by Mike Motz. ­­It is a great story that is written in the animal’s perspective and voice that exposes the harsh realities of puppy mills and the mill dogs who live in poor health conditions. The book begins by introducing readers to Deputy Paws, an adopted rescue dog who now lives with his new and loving family, he has his own bed, toys and a backyard to run and play in. Deputy looks back on his life in a puppy mill and shares some harrowing details of how abruptly he was separated from his mother, the wire cage that was his whole world until he found a forever family to call his own. Deputy shines some light on the sad condition the “breeders” keep the mothers in while they’re forced to deliver puppies over and over again, and the fates that befall them once their work is done. Deputy is committed to sharing his story to raise awareness about the importance of pet adoption and to save other dogs from the same sadness he endured. Peggy introduces kids to some of the tools such as kindness, new laws, donation, raising voices and taking a strong stand that can be put to good use ­to help end this abuse. The author hopes that the book will encourage parents and children to adopt a rescue dog rather than buying from a puppy mill or pet shop dog. Deputy Paws and the puppy Mill Cause is based on the true story of Peggy’s adopted puppy mill rescue dog, Deputy. This beautiful tale addresses the reality of puppy mills while keeping the story light, warm, and accessible to young readers. I love that there are concrete actions proposed to get kids and families involved in shutting down puppy mills. With realistic colorful illustrations by illustrator Mike Motz, and an appendix featuring information about puppy mills, breed rescue groups, animal shelters and a checklist of choosing a pet, dog-crazy young readers will beg for more! The story is well told, fast-paced, and introduces children to the importance of being a responsible pet owner. A portion of profits from this book will be donated to animal rescues, shelters, and organizations who promote animal welfare. So grab your copy of Deputy Paws and the Puppy Mill Cause and be part of the change. Overall, We highly recommend parents, teachers, and librarian to read the Deputy Paws to children because it will teach them to be kind to animals and will instill a greater knowledge and compassion in its young readers! ***Disclaimer: Many thanks to Peggy Race for the opportunity to read and review. Please be assured that our opinions are honest. If you haven’t already done so, Check out Deputy Paws and the Puppy Mill Cause review on the Reading with Your Kids Podcast & feel free to share it by using the social media buttons at the bottom of this page. We would LOVE if you could leave us a review on iTunes.